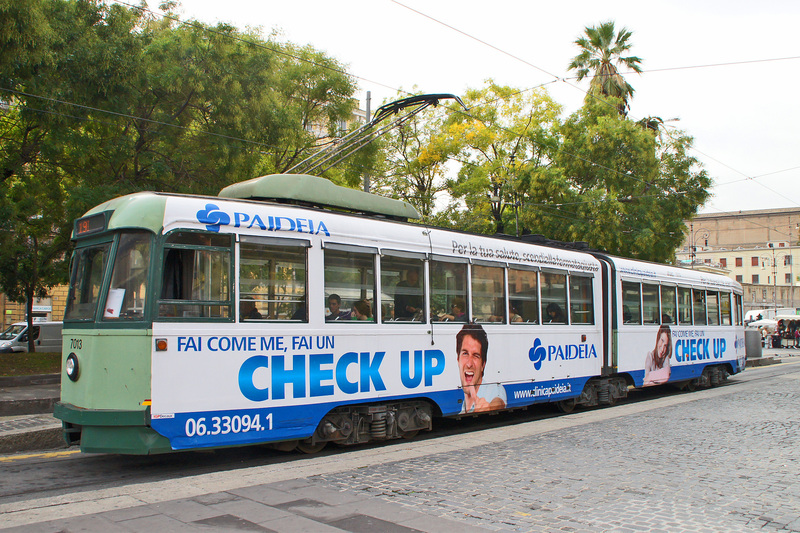 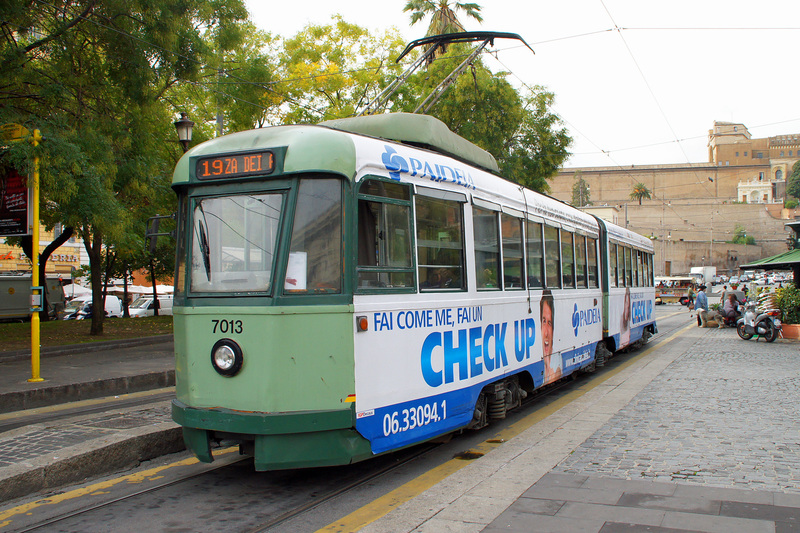 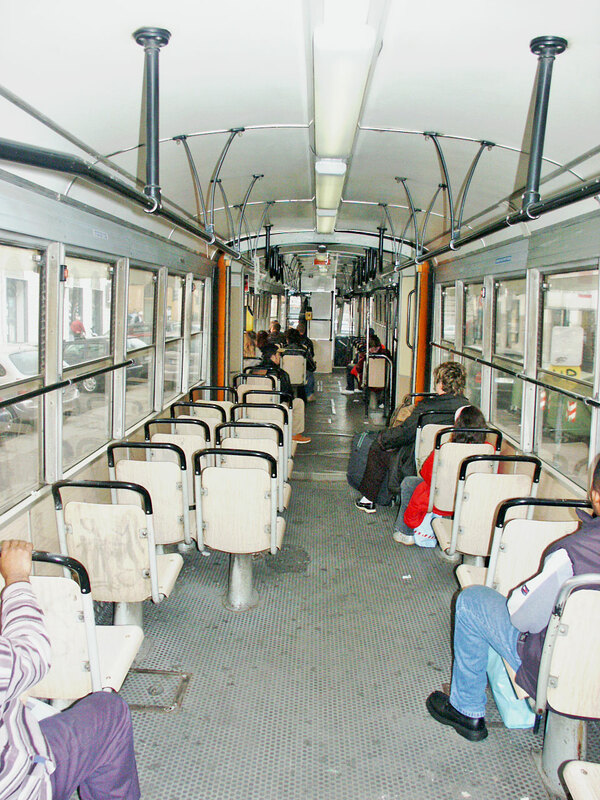 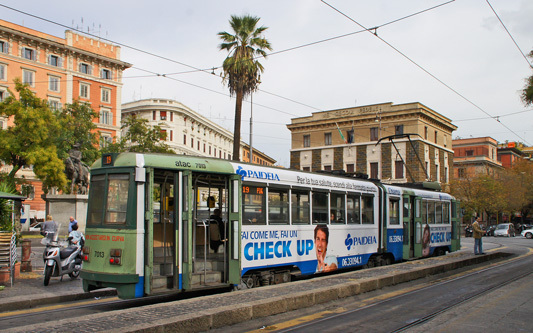 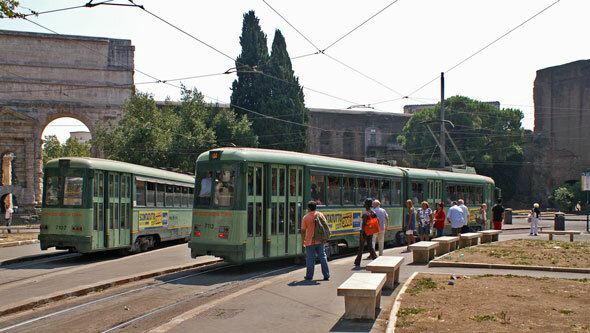 This page shows images of the 7000-Series of 6-axle trams of ATAC, Rome's transport authority. 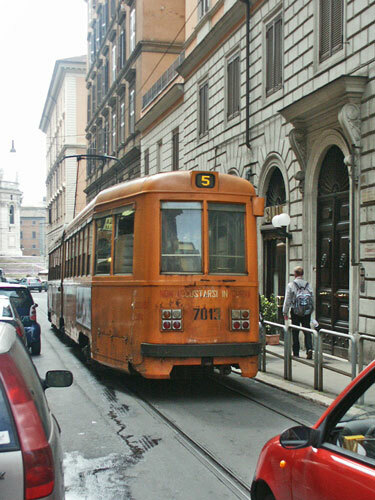 They are known as the Stanga Class after their builders. 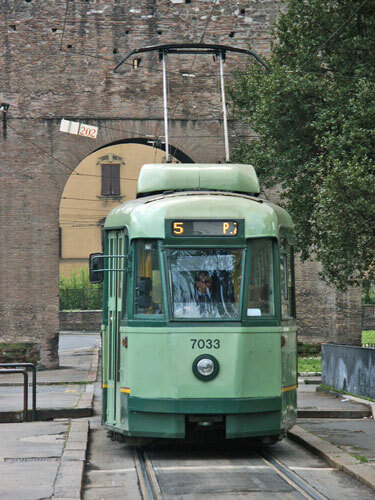 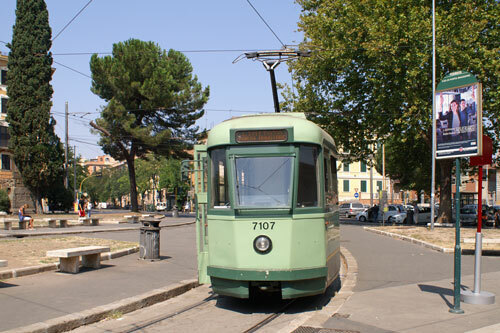 50 trams numbered 7001-7099 were delivered between 1948-49 - only the odd numbers were used to number Rome powered cars at this time. 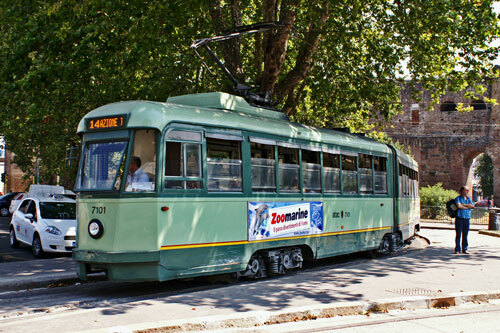 In 1953, a further batch of 8 similar trams (with more powerful motors) were supplied to STEFER (Societa Tramvie e Ferrovie Elettriche di Roma) for their standard gauge interurban line to Cinecitta. They were numbered 501-508 in STEFER service, but became 7101-7115 when they passed to ATAC in 1980. 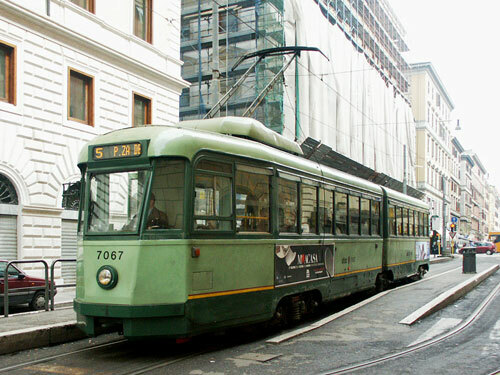 The original prototype articulated tram 7001 of 1941 was damaged in the war, and was scrapped in 1950. 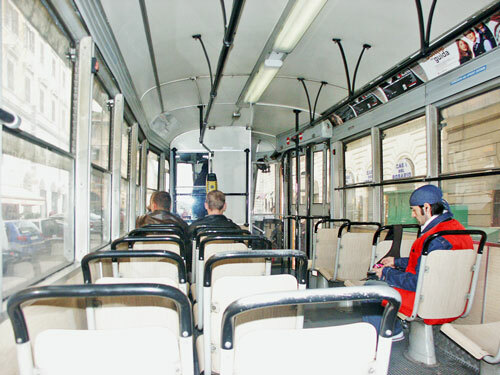 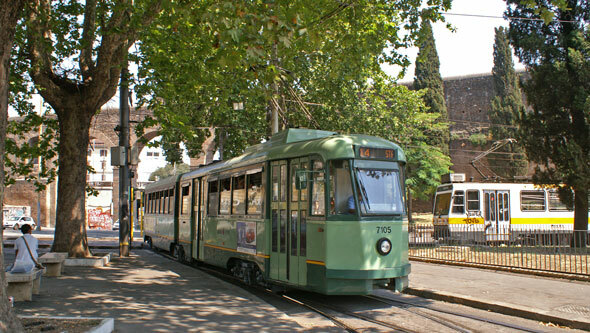 This page is one of a series devoted to photographs of the Rome tramways, run by ATAC (Azienda Tramviaria Autofiloviaria Comunale). 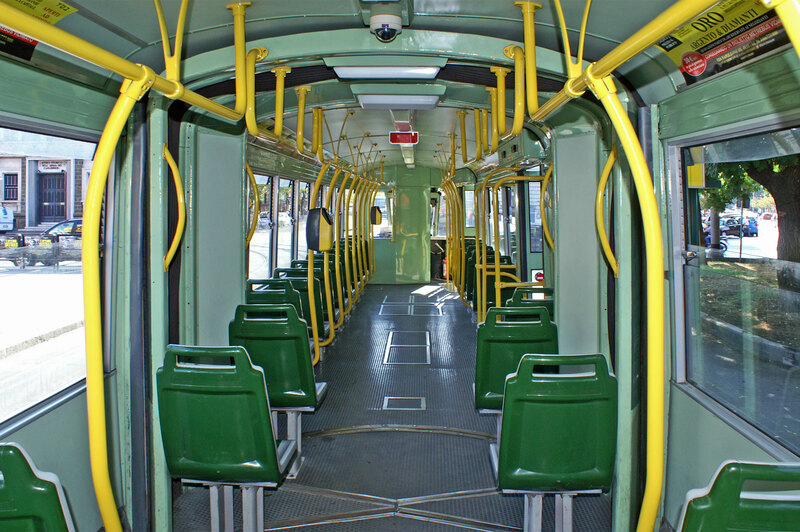 The system has six routes, as shown on the maps below. 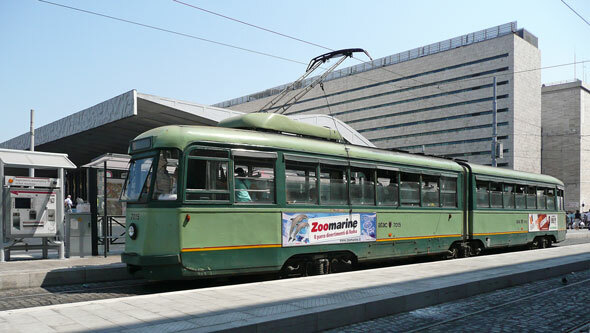 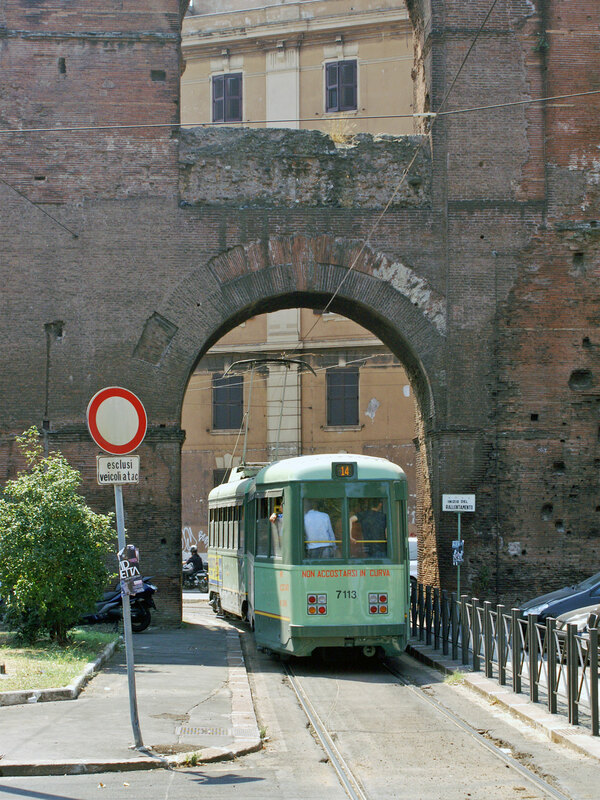 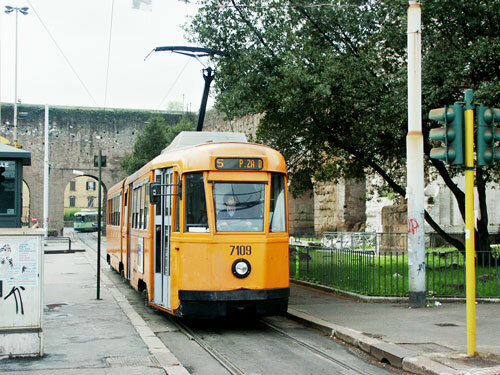 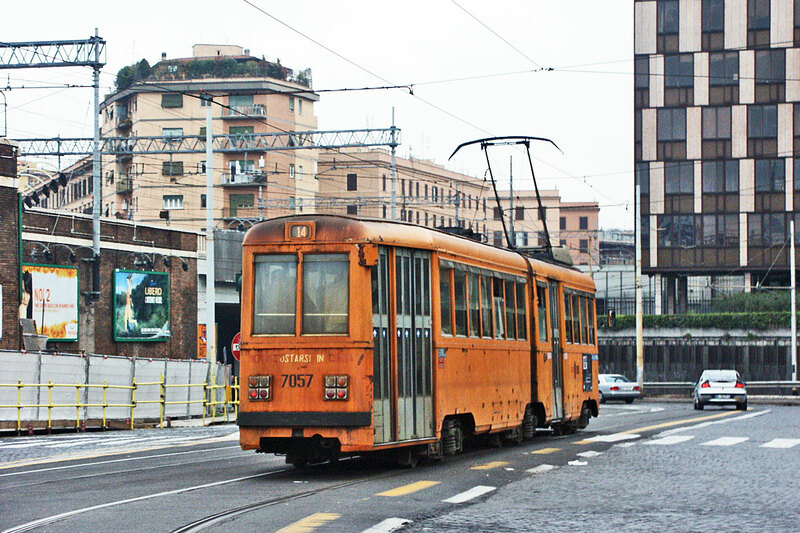 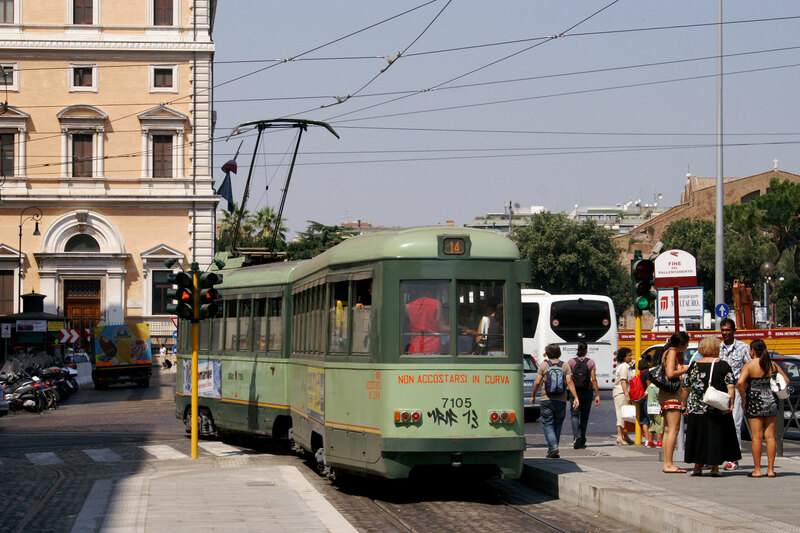 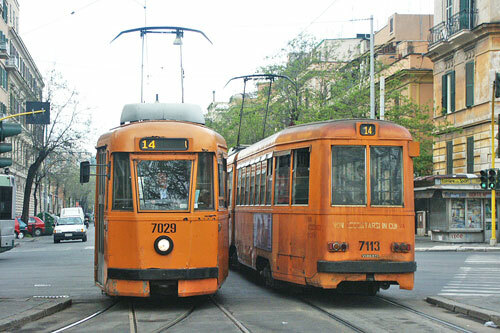 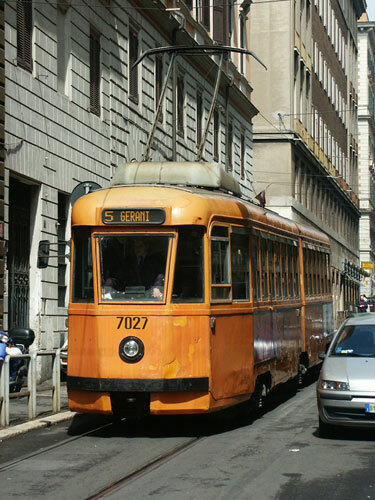 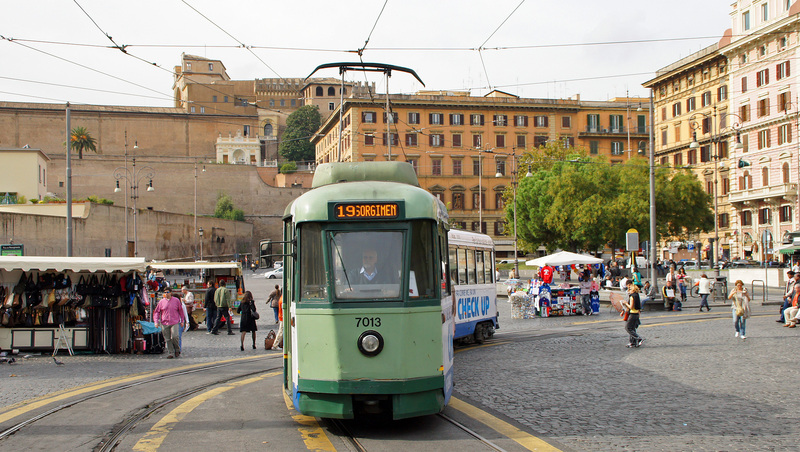 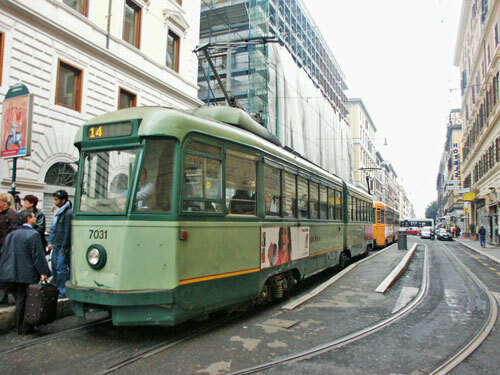 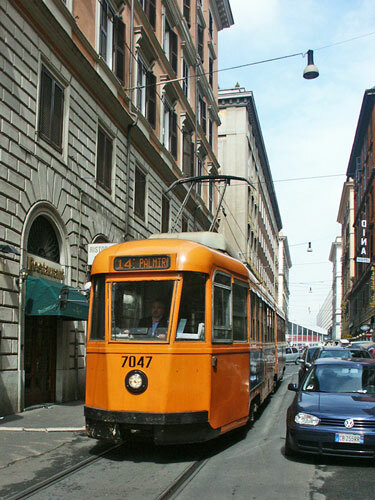 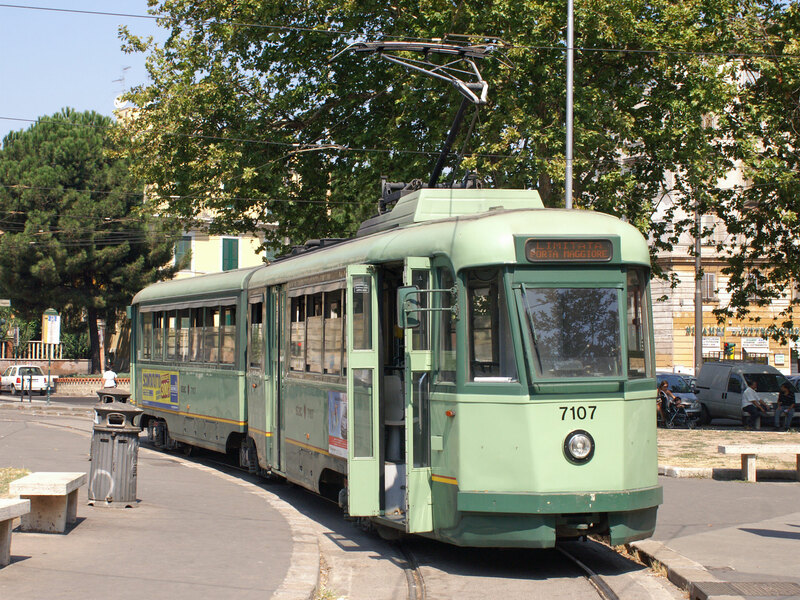 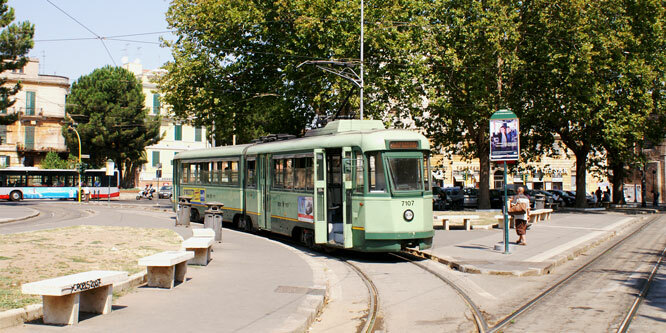 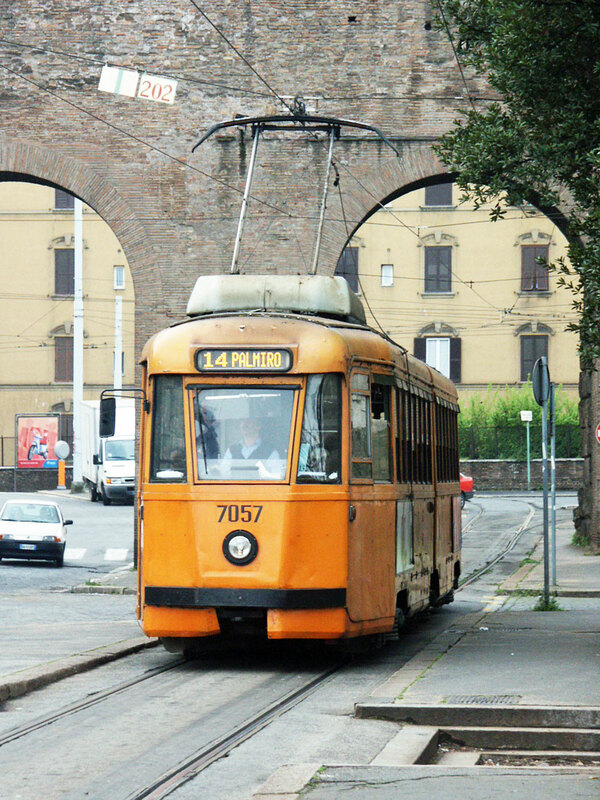 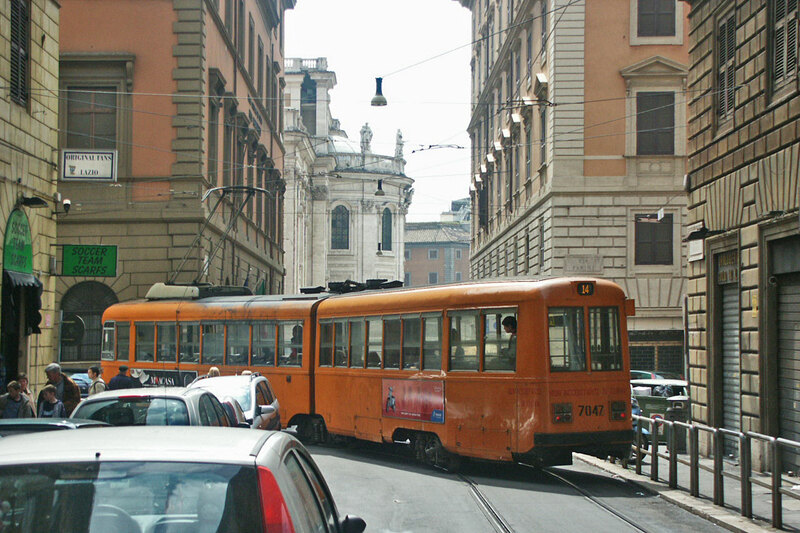 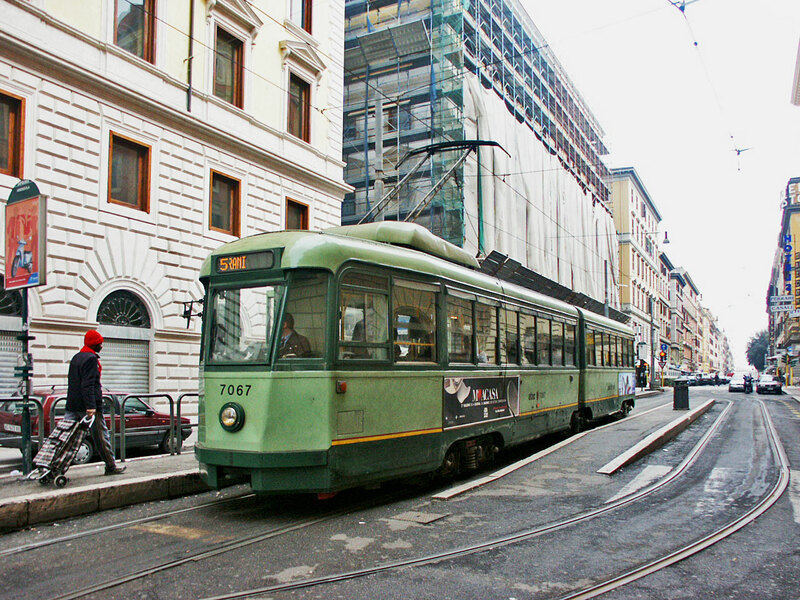 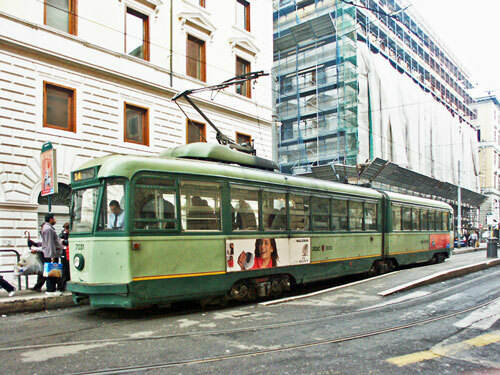 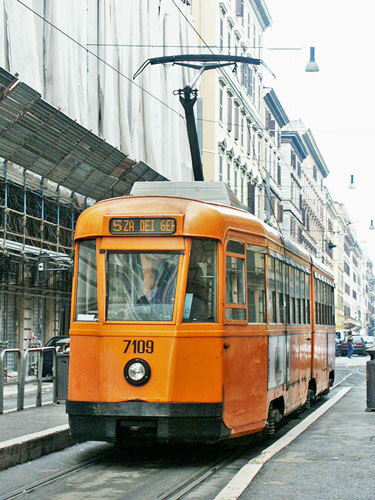 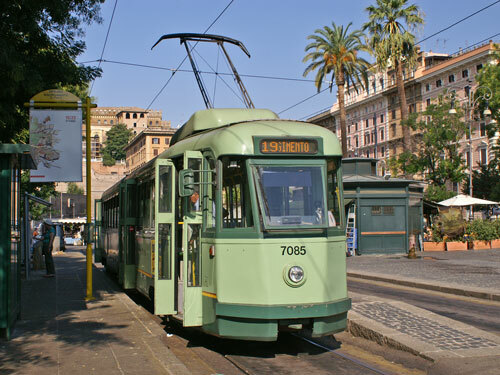 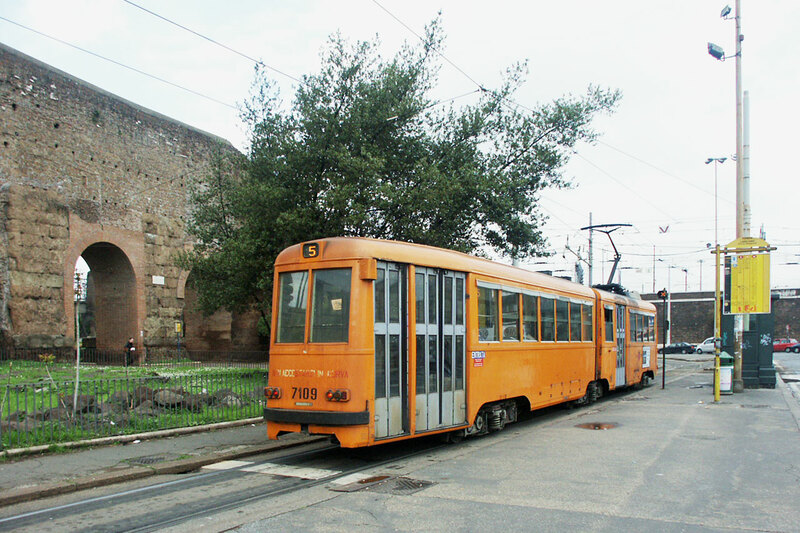 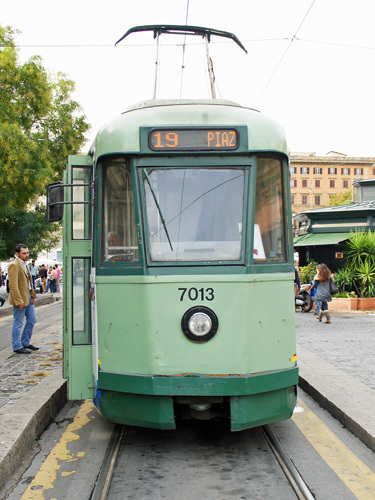 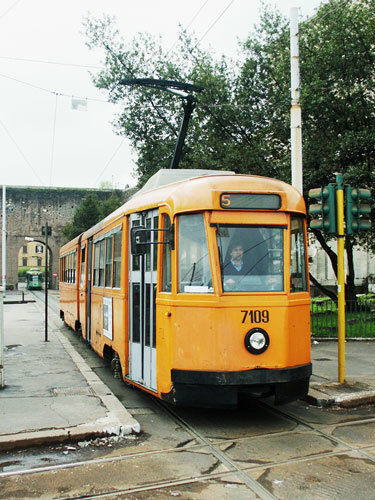 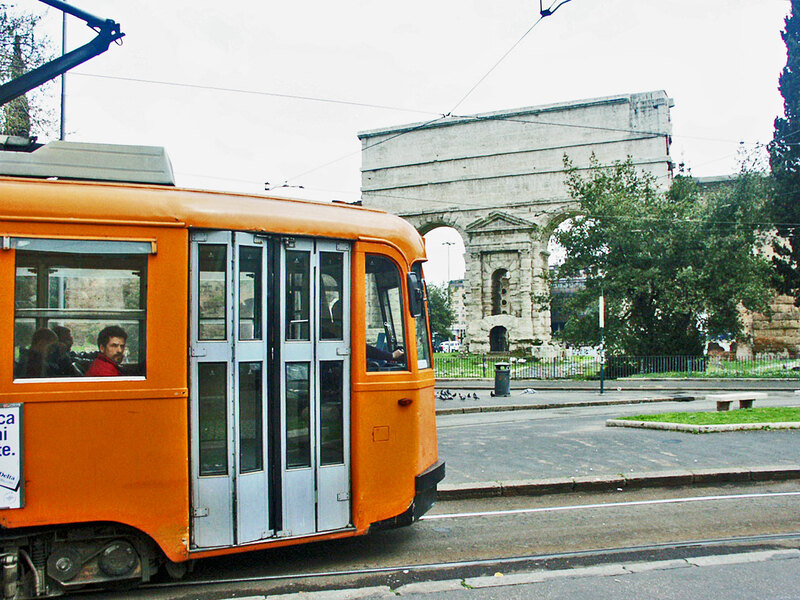 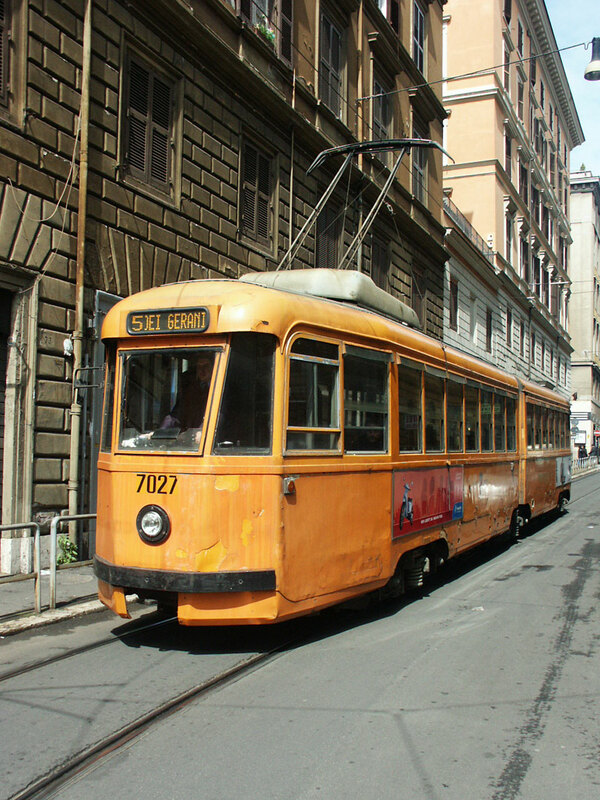 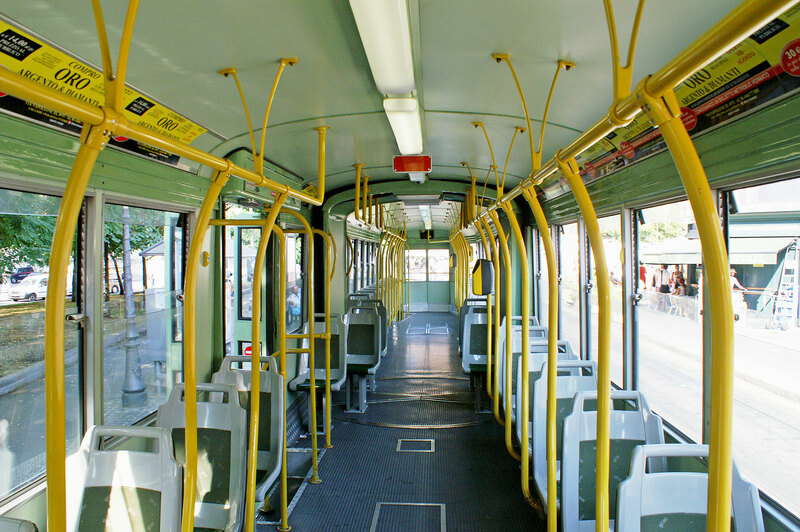 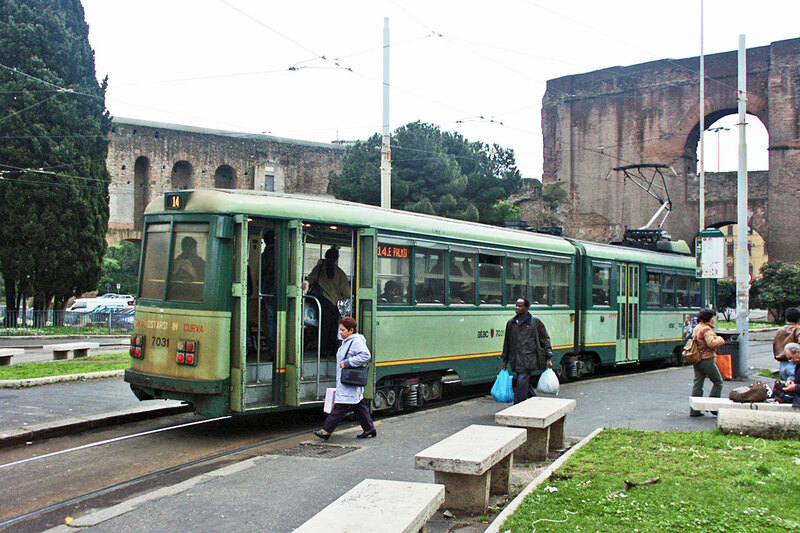 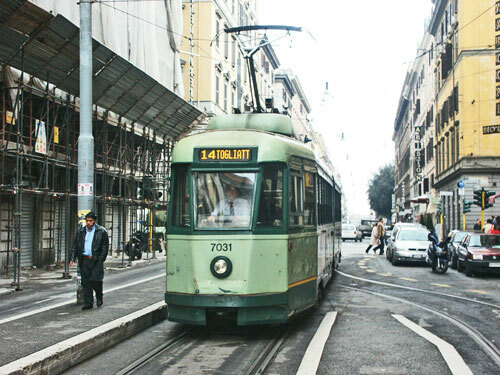 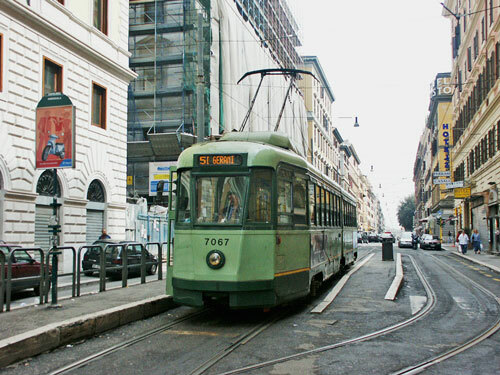 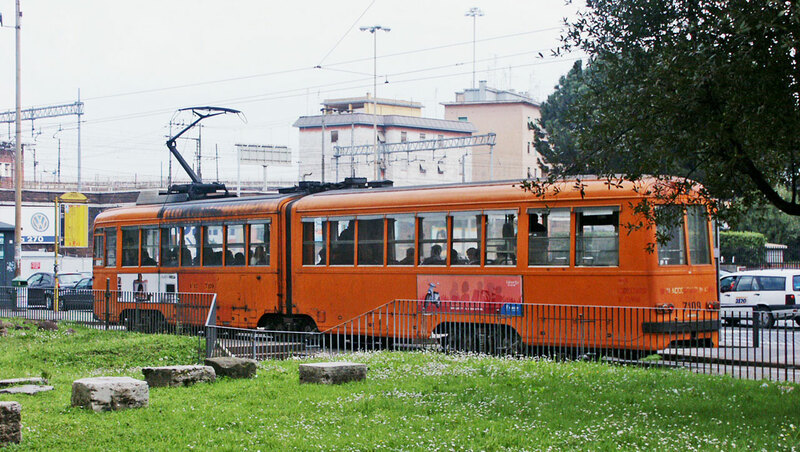 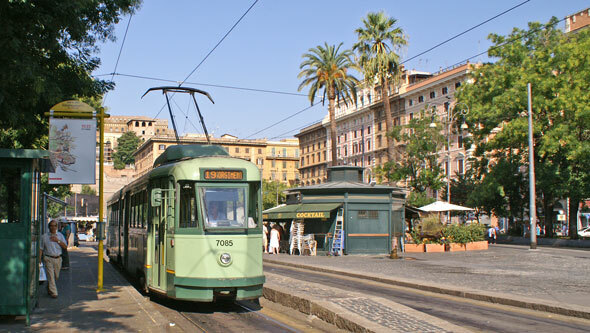 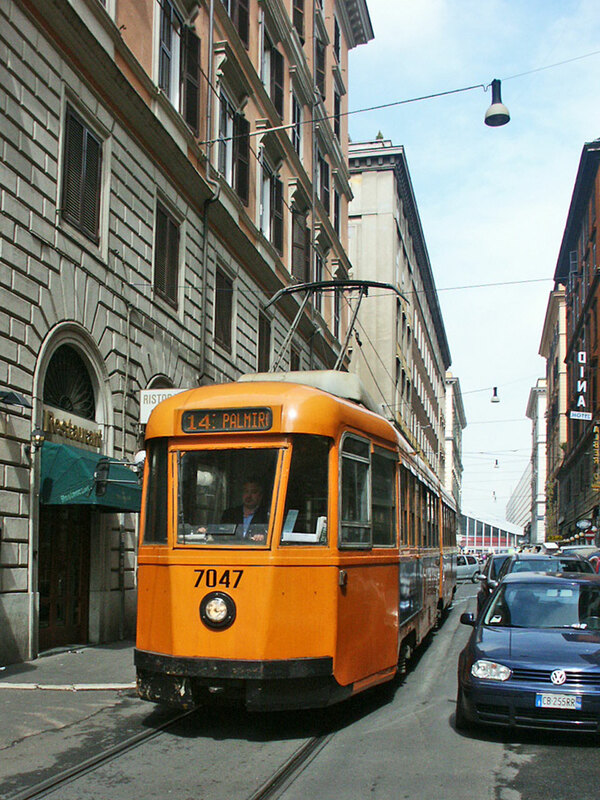 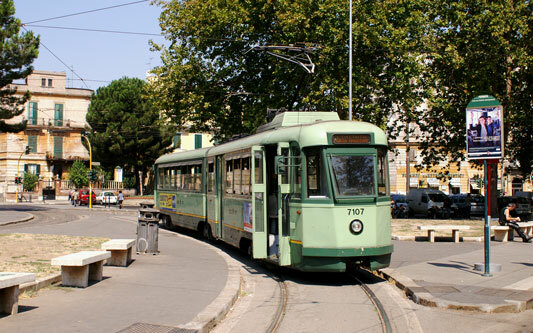 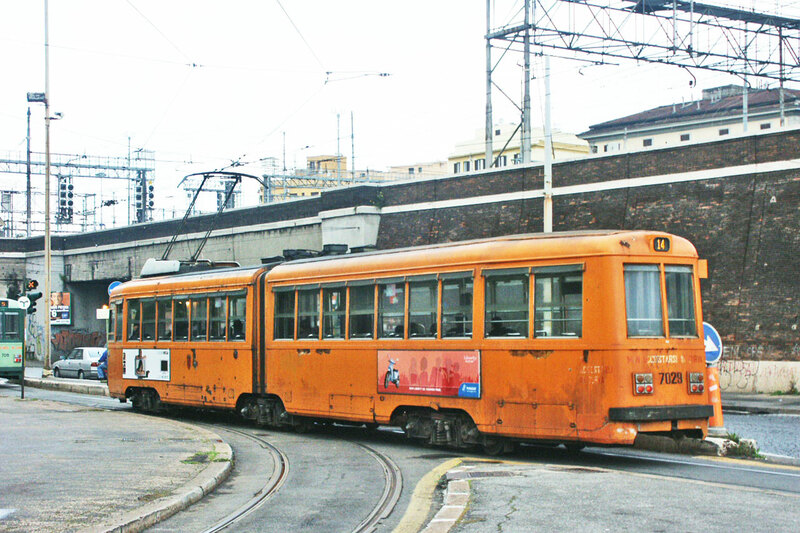 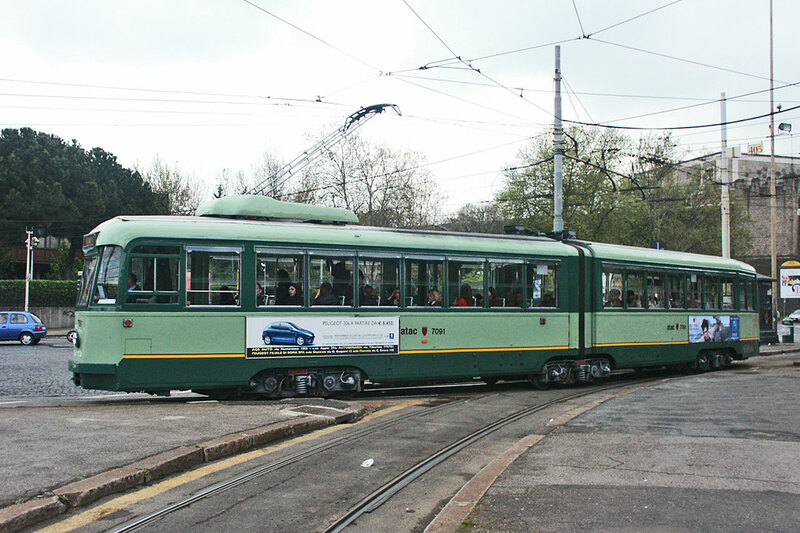 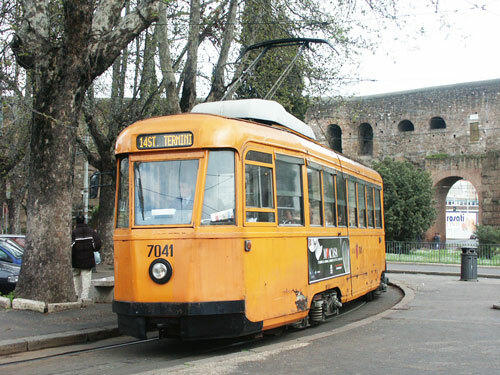 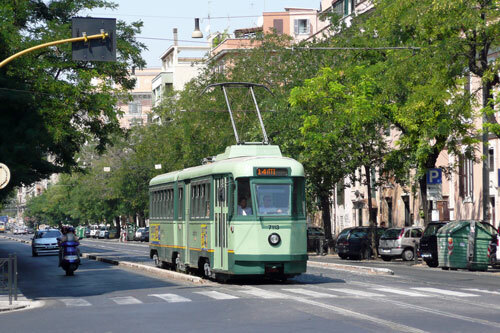 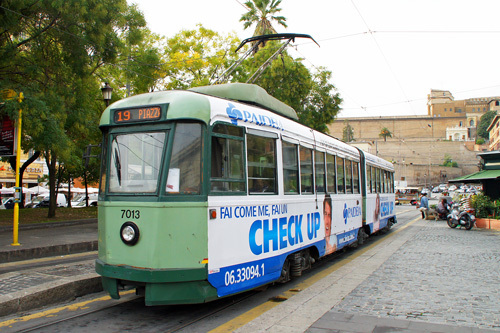 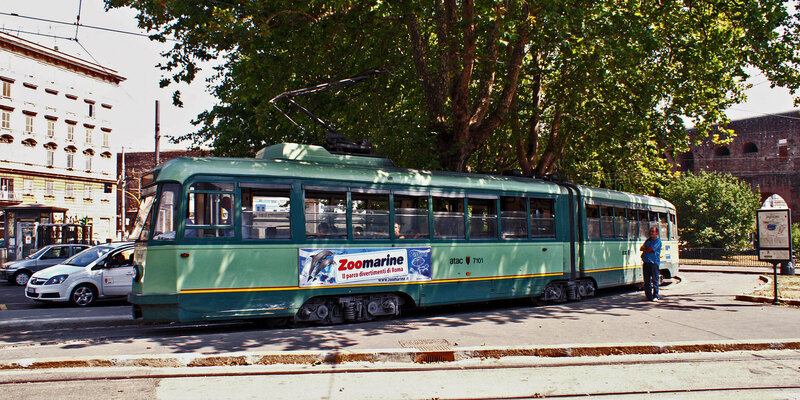 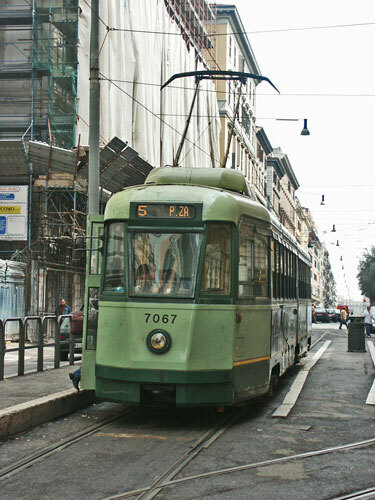 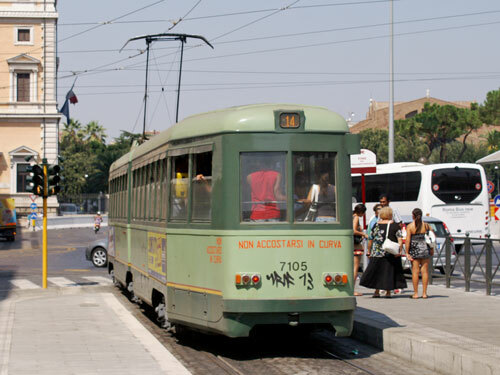 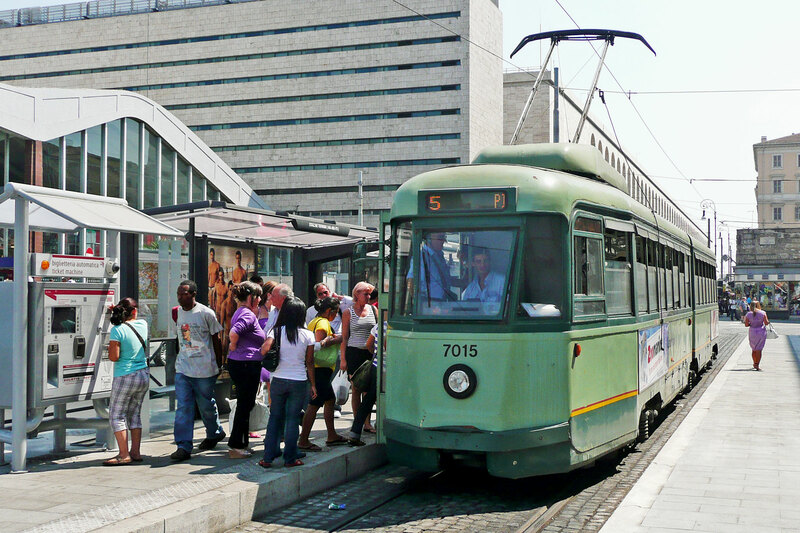 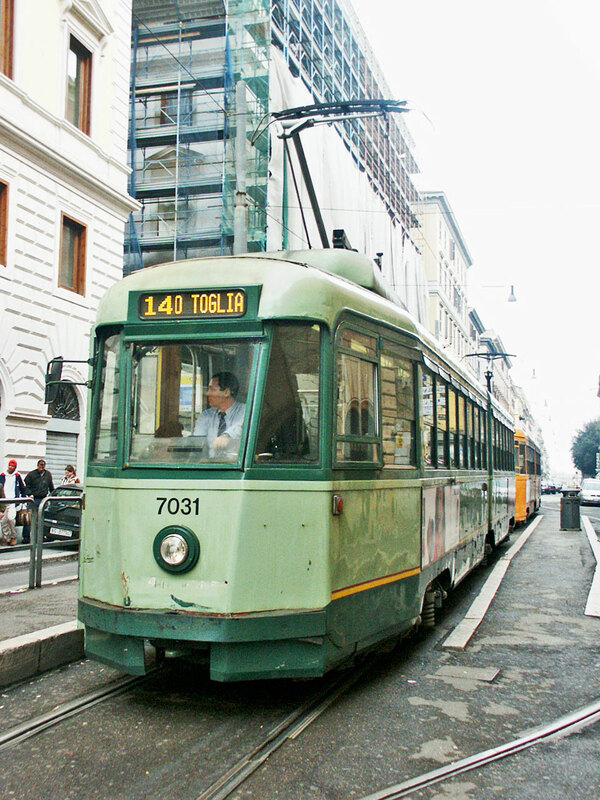 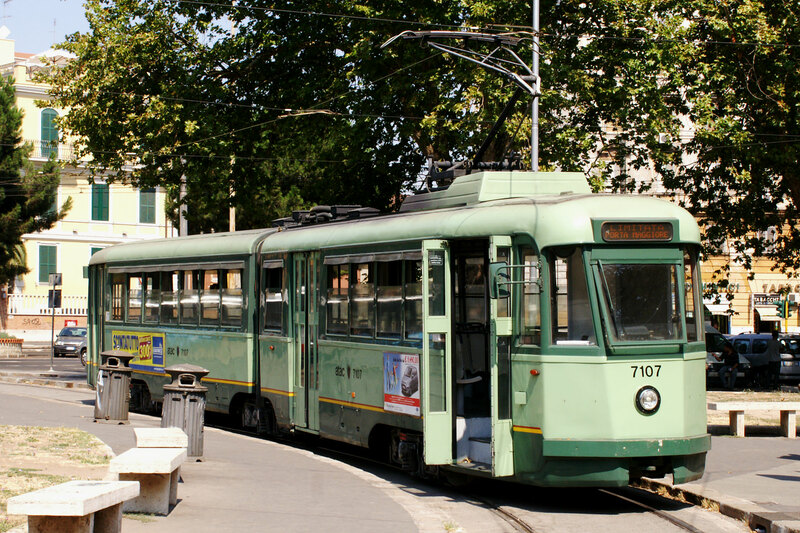 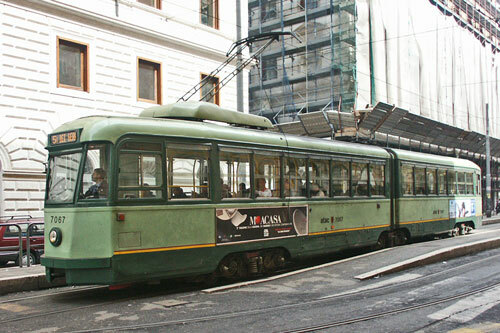 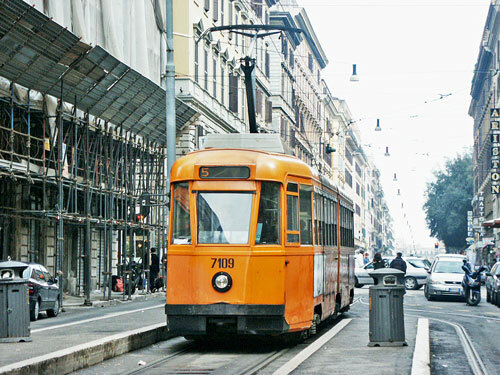 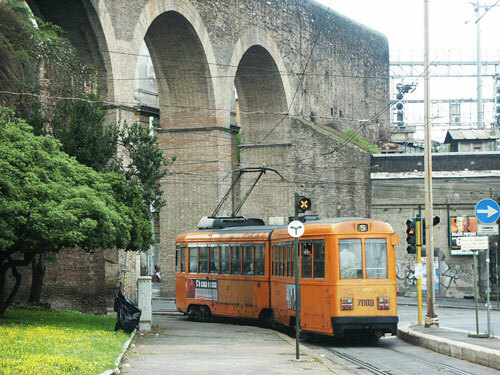 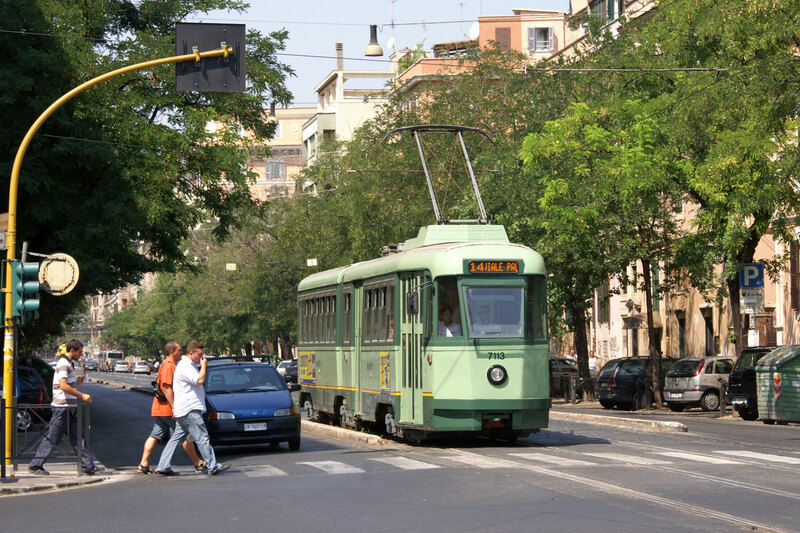 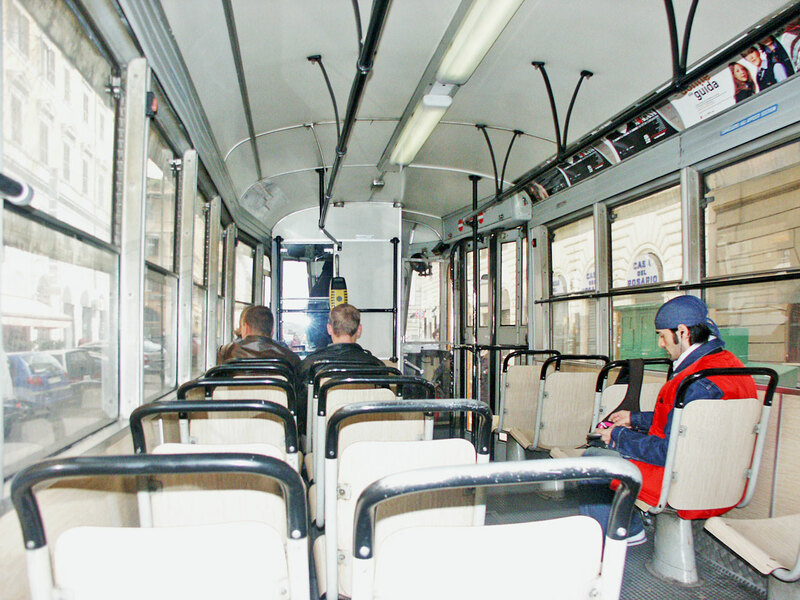 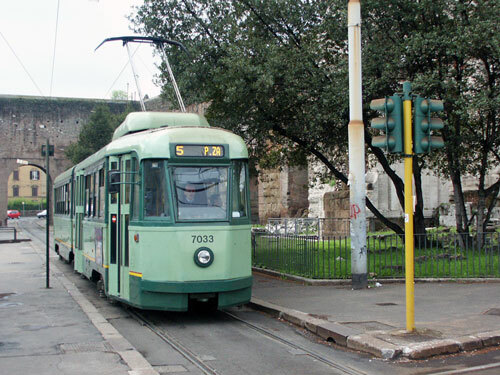 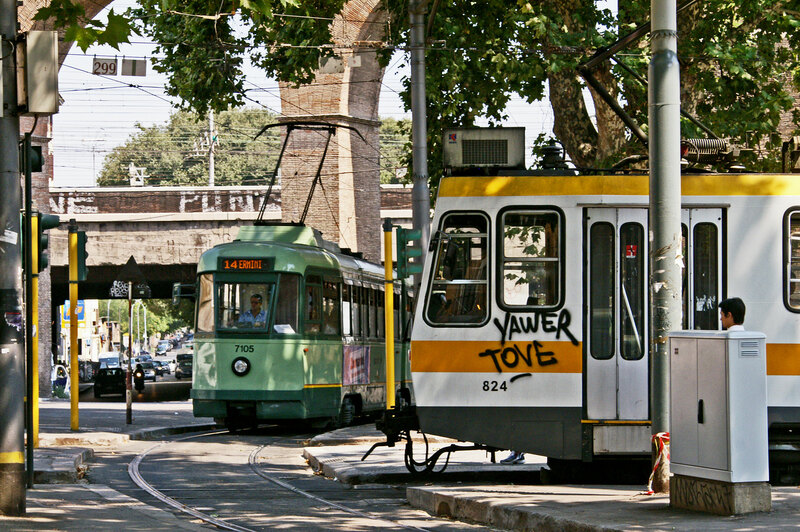 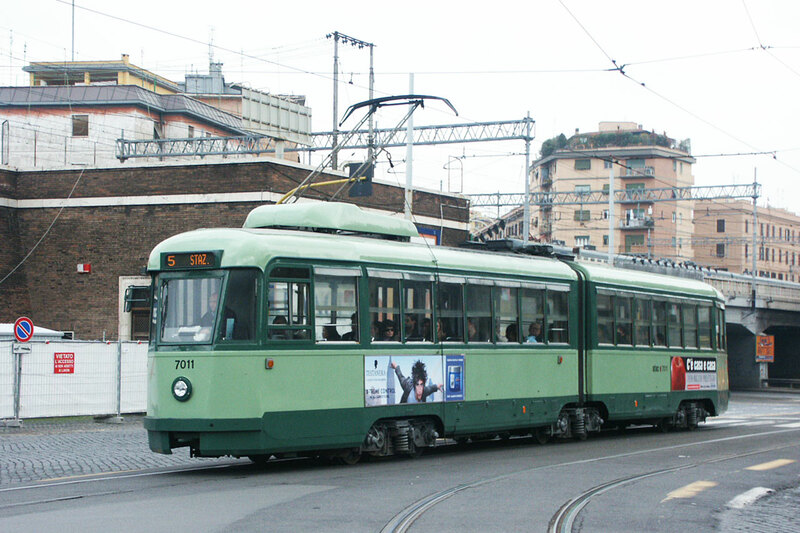 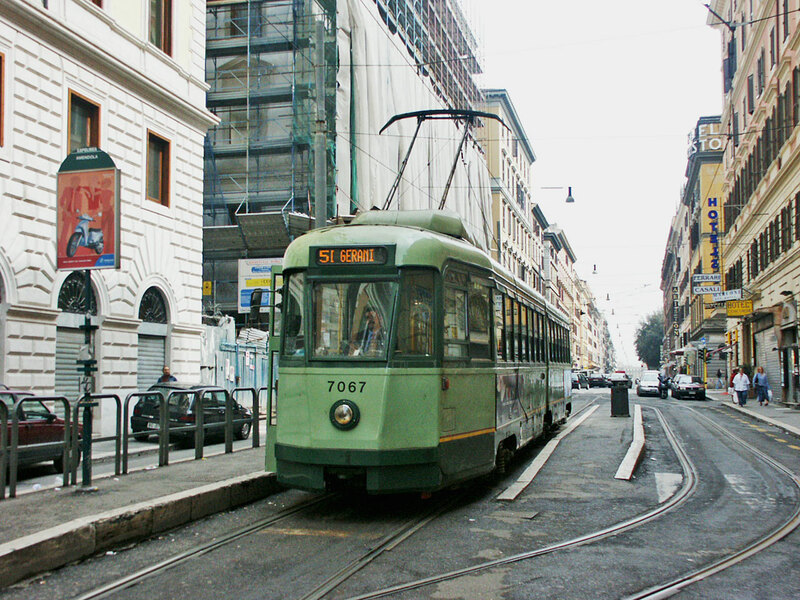 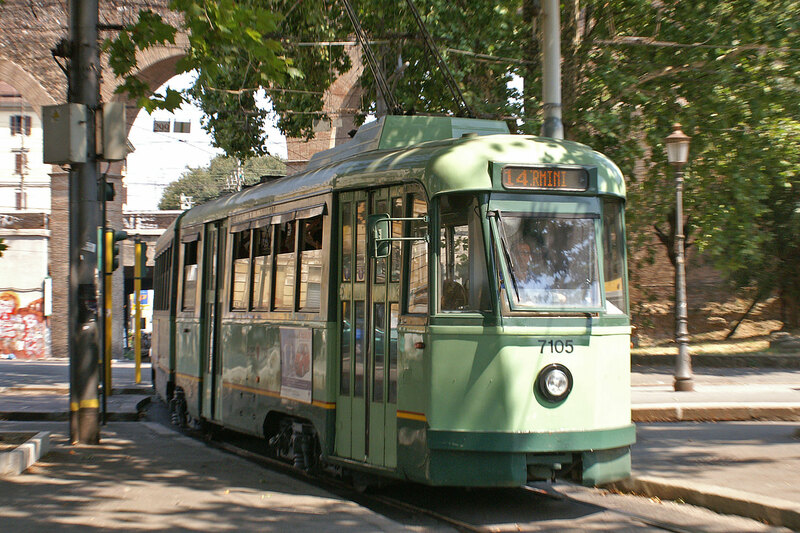 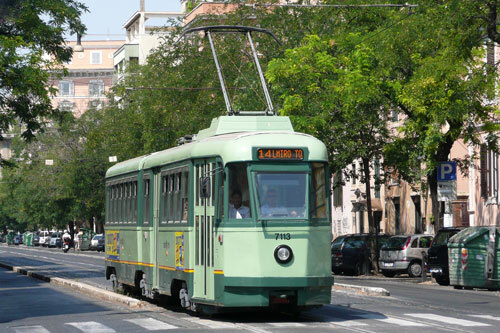 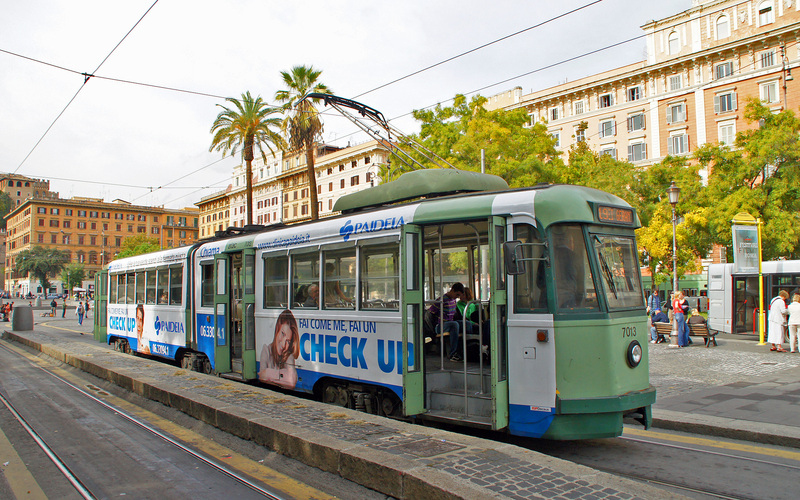 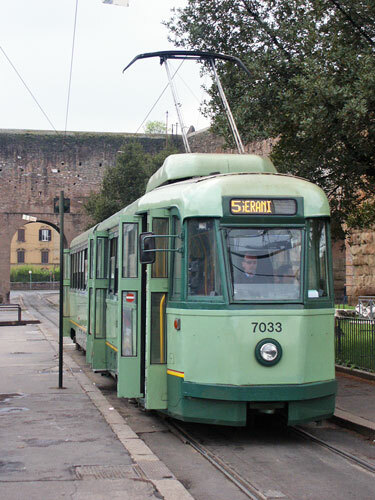 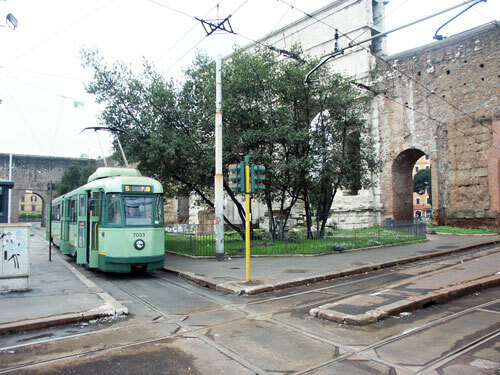 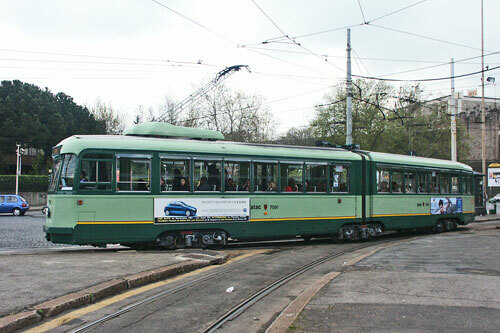 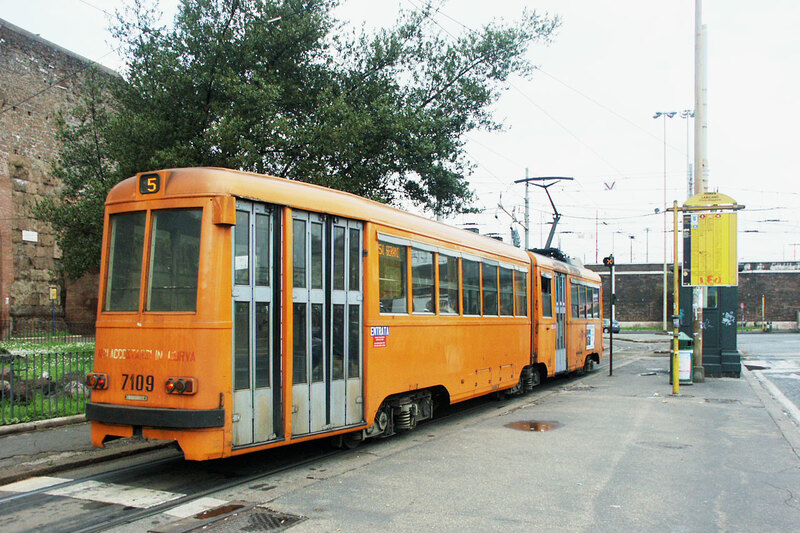 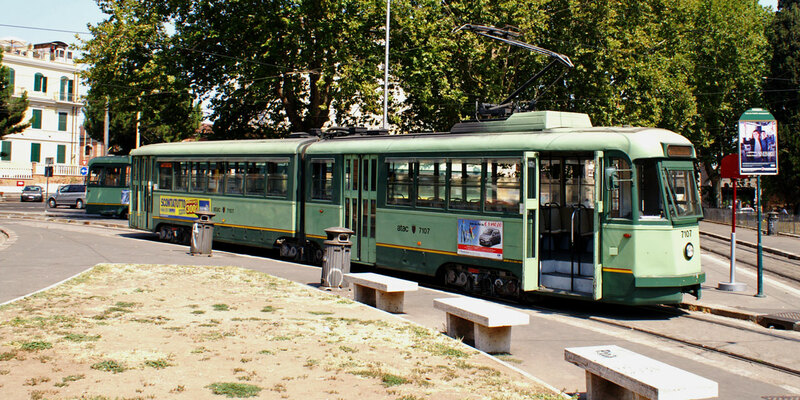 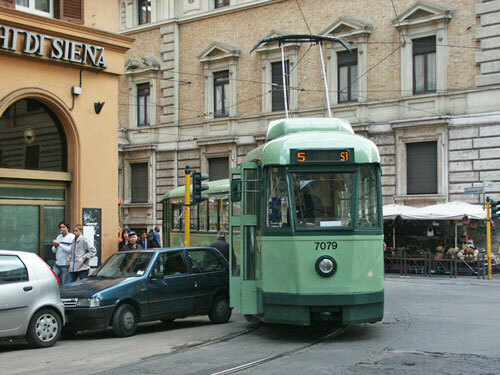 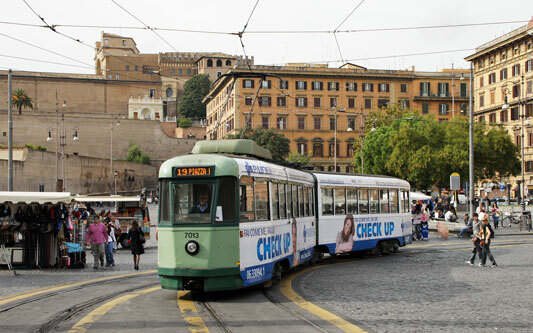 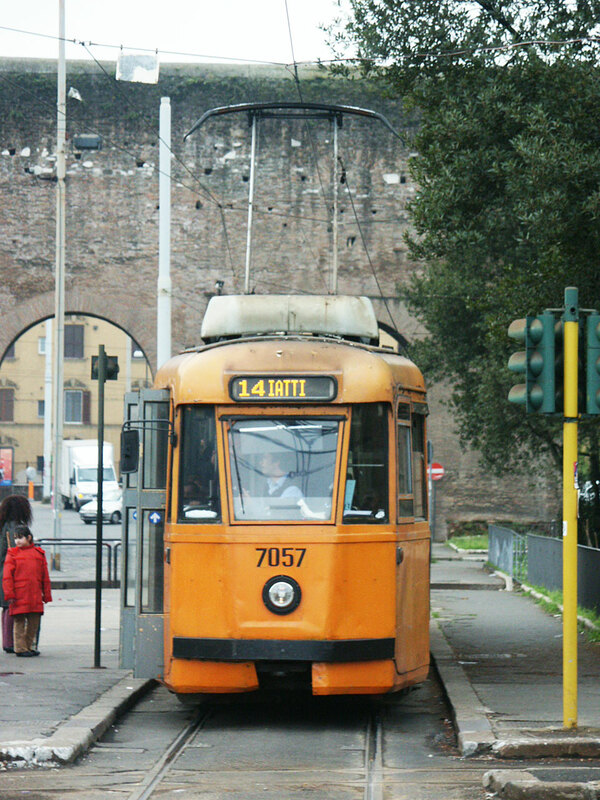 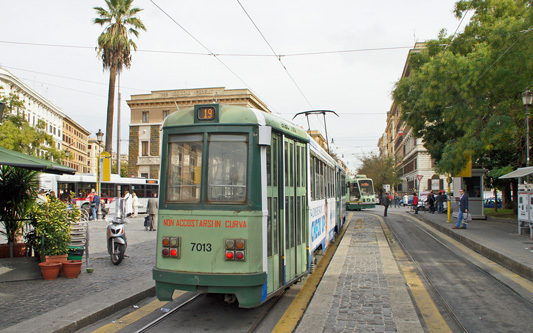 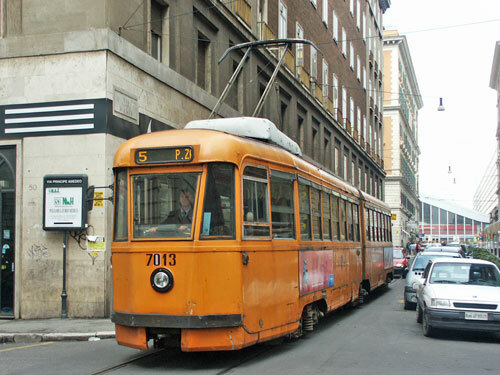 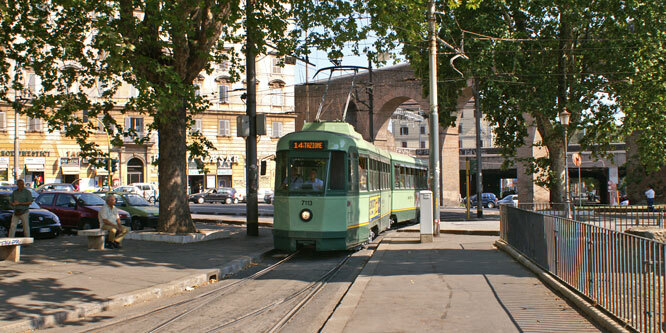 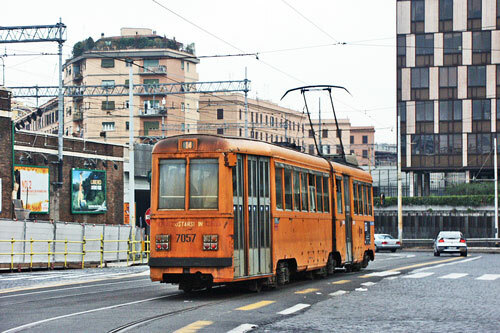 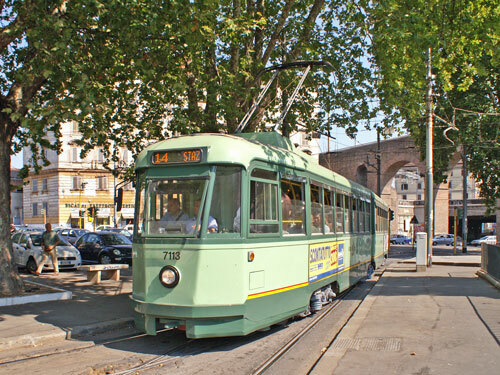 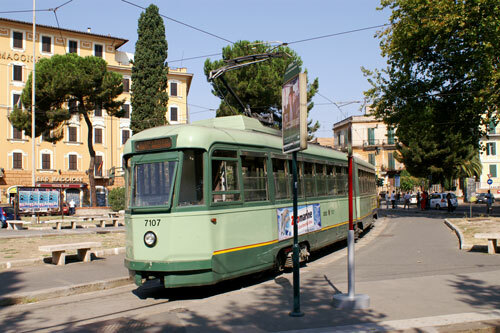 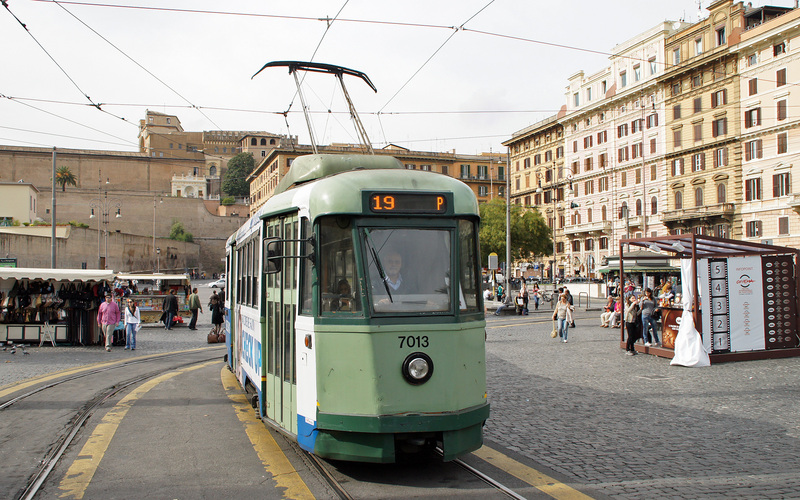 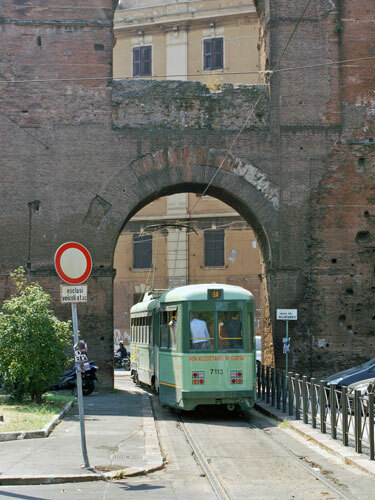 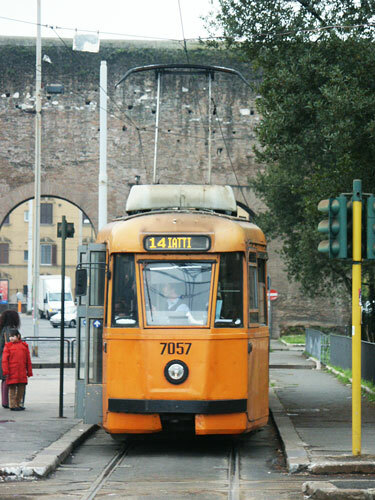 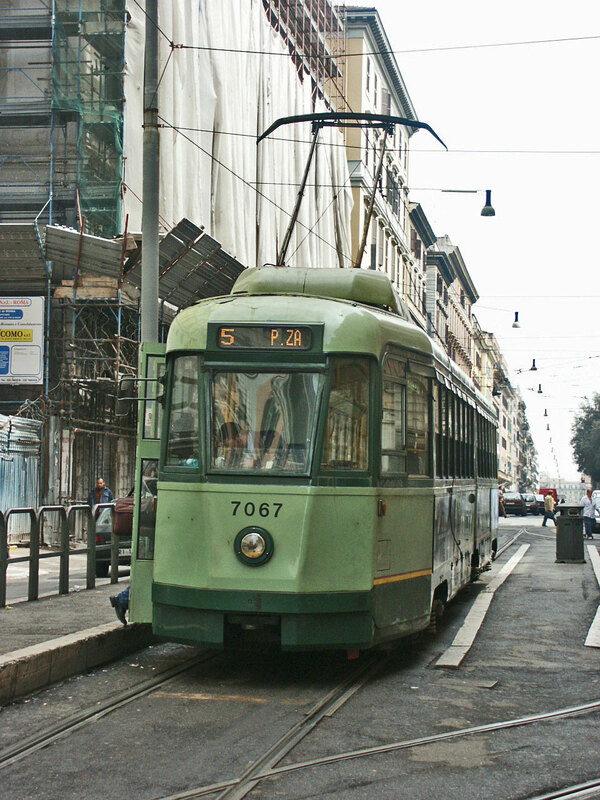 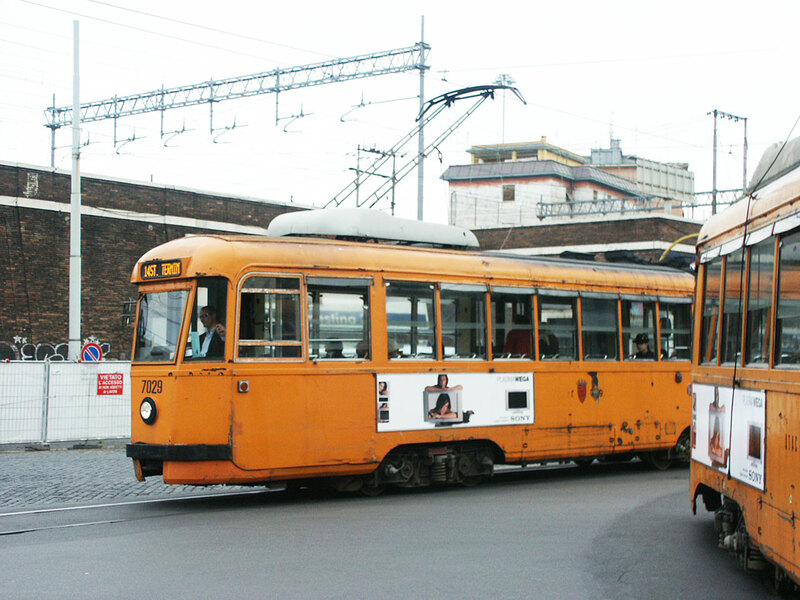 From the 1930s, the livery of Rome trams was green This changed to orange from the 1970s. 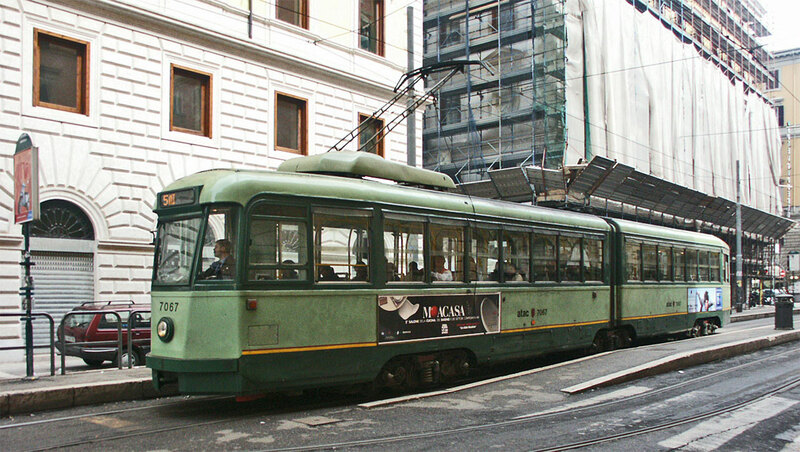 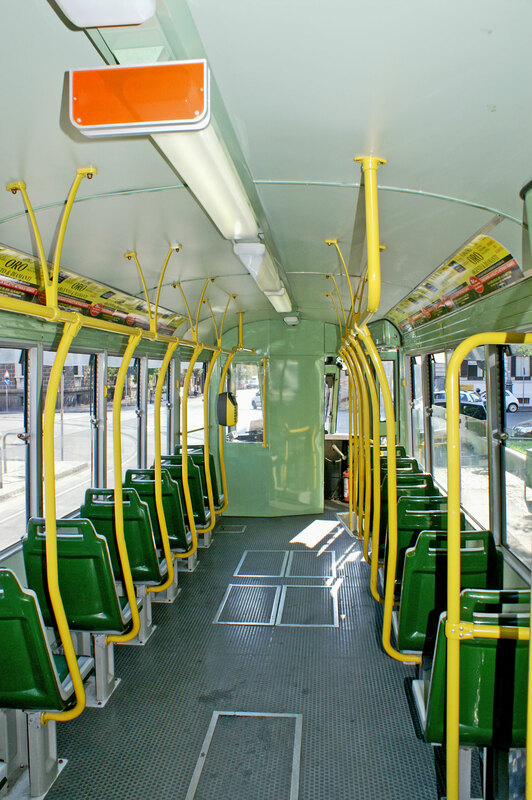 New articulated trams delivered in 1998 reverted to an attractive two-tone green livery, and older trams are being modified also. 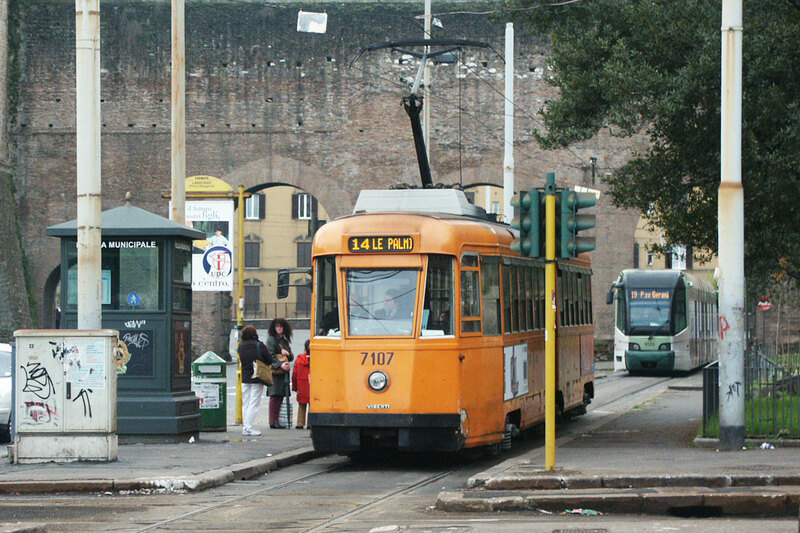 Click on the maps below to open larger versions in a new window. 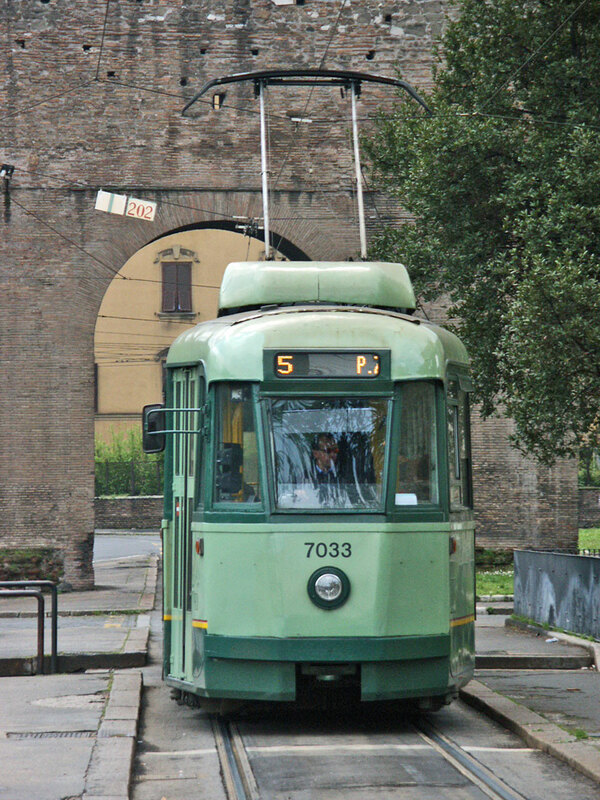 Rome Page 2 - Stanga Trams7000 series - this page! 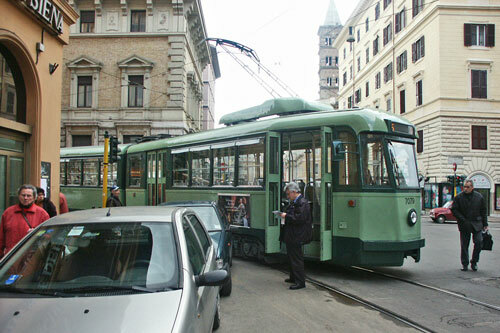 The 7000-Series of 6-axle trams consist of two batches. They are known as Stanga Class after their builders. 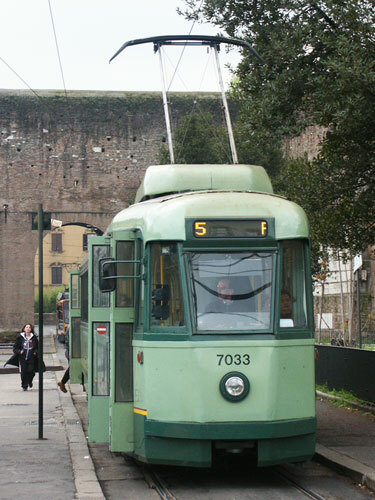 50 trams numbered 7001-7099 were delivered between 1948-49 - only the odd numbers were used to number Rome powered cars at this time. 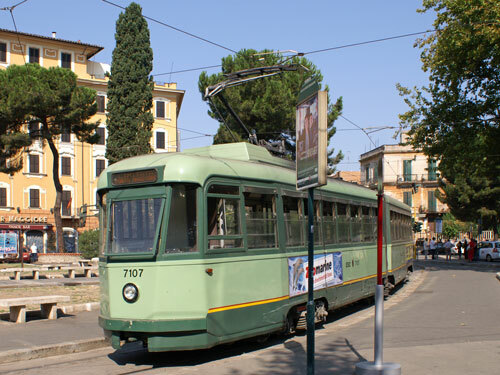 In 1953, a further batch of 8 similar trams (with more powerful motors) were supplied to STEFER (Societa Tramvie e Ferrovie Elettriche di Roma) for their standard gauge interurban line to Cinecitta. 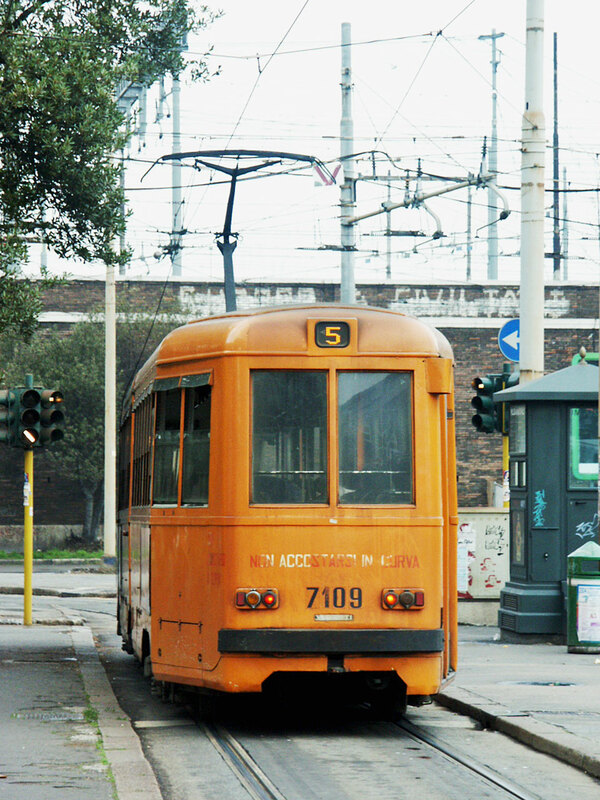 They were numbered 501-508 in STEFER service, but became 7101-7115 when they passed to ATAC in 1980. 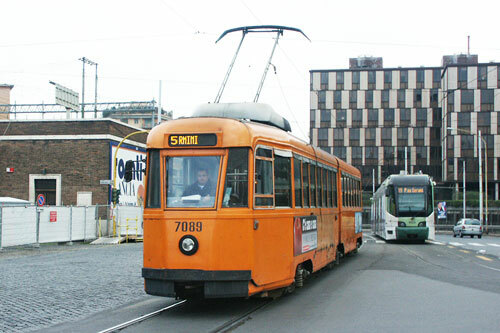 The original prototype articulated tram 7001 of 1941 was damaged in the war, and was scrapped in 1950.